Stopped in for lunch and just loved it. The food was great and the staff very friendly. Our server was very attentive and kept our water glass filled. Highly recommended. Late breakfast on Sundays. As good as L’s Kitchen but less expensive. Great waitress and hosts. Many times with family. Ask for Jessica. My husband and I ate a late breakfast here. All our food was cooked perfectly and tasted delicious! The fruit was nice and fresh! The service was outstanding. I would recommend this restaurant to anyone! really good omelette and great service. I would definitely eat here again if I were in the area. yumm! If you want to taste a typical US dinner this is your place : lots of choices and big quantity! We had the omelett (very good) and fries (a bit too fat) and french toasts - coffee with free refill ! 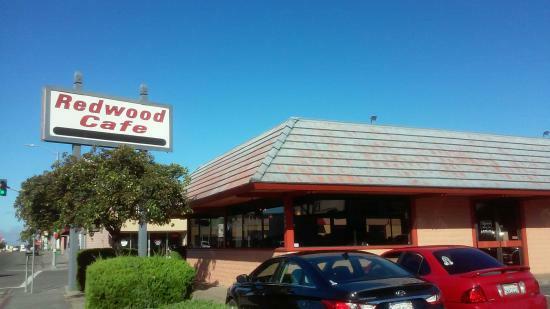 Redwood Cafe is a great spot for both breakfast or lunch. The servings are generous and always very good.Nice selections on the menu. The food here is decent and priced well. My services has always been good. Have held office meetings and personal lunch. A very nice little home town lunch. The down is it is not open for dinner but Peppers its sister is. Get quick answers from Redwood Cafe staff and past visitors.